Clemson probably didn't test him right, or decided that the success of their program was worth more than his health, and so played him. Lol ok. Never mind he hasn’t been with a college since April. His biggest question mark was that some thought he was lazy in hs. Hence the reason he was a low 4 star initially. Who said he's not in shape? The fact that he came in 30-40 pounds overweight says that. I was being lighthearted or sarcastic about the Clemson thing, but I suppose reading back on it I never wrote anything to give it away. I've read varying reports on his weight. ..Although I dont think klempzun would play a kid with health problems but if you look at their track record, it is possible they do take some chances with players health. Korn and Watson just to name a couple. With the Watson situation there was no way he could have made it any worse. A torn acl is a torn acl is a torn acl. Once it’s torn it’s not like he can retear it. At that point it’s just management and can they handle the pain. Tajh Boyd for instance played his entire senior year of hs on a torn acl. That's ridiculous. Injuries can get worse and if you're slowed by one injury you can certainly sustain additional ones. 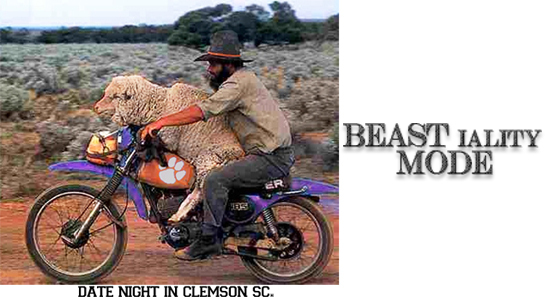 I'm not judging Dabo or CU at all. Watson clearly had a good day and the offensive plan was geared to protect him but anything can happen. We just had little to no pass rush and the back end of the D wasn't much better. Everyone knew it and it was an acceptable option with reduced risk. Back to Belk, regardless of which rumor we want to believe, he took extended time away from S&C, missed practices,etc, he can in no way be as close to ideal shape as those that have been. Saying so is an insult to the work others have put in. Even if Belk is cleared to play this year (and that is a big IF)...I am not sure he sees much time in the first half of the year due to his level of conditioning. He may be someone that comes on in the latter part of the season...again...if he’s cleared by the NCAA to play immediately. Several hurdles for this young man to see the field this year: the NCAA, current level of conditioning, breaking into the 2 deep as a true freshman all come to mind. Whether he plays much this year or not...it’s great to have Belk on the squad and hope he adopts Kinlaw’s commitment level to fitness and conditioning. Belk could be a beast for us if he and when he is ready to hit the field. He can't even get into football shape yet. We will be lucky: 1) if he is even eligible this year; 2) if he is ready to go after the bye week. More attention needs to be put on the guys that are practicing and how they are develop vs a true freshman that is a huge question mark for this year. This is a good point. I'm going to spend my time thinking about the guys who came in ready and in shape to play. The fascination and obsession for many people is that he transferred from Clemson after saying he was unhappy there. I will wait and see if he makes his mark here or is just passing through. No it's not.... You can do damage to other ligaments. Or over-compensate with the other leg and injure that one. NCAA granted waiver for UGA WR Demetris Robertson who transferred from CAL. I don’t think he really had a reason to transfer outside of wanting to be closer to family in GA so this may bode well for Belk. His mother is sick and has been given about 6 months. Fact!